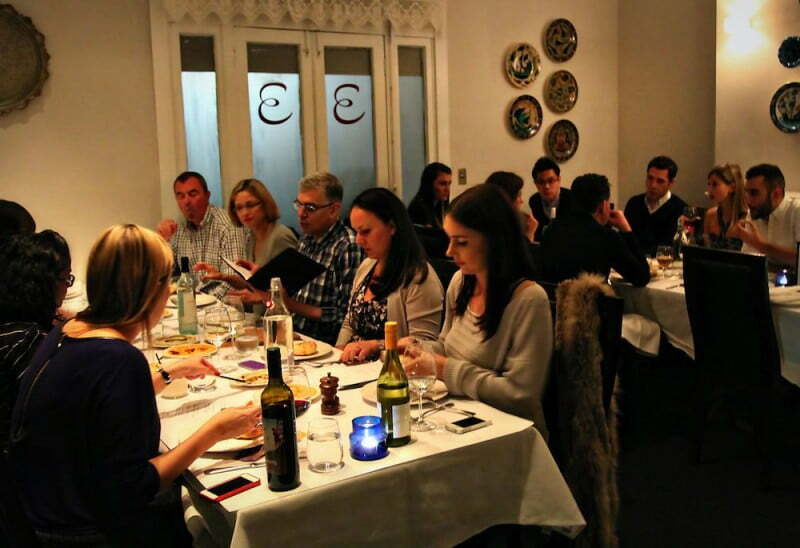 Come and celebrate with Efendy, Sydney’s beloved Turkish restaurant. Can you remember turning 10 years old? You’d finally left your single digit years behind you. Your sense of independence increased as the end of primary school approached. You apprehensively awaited your teenage years. It’s an exciting time, sure. A restaurant’s 10th birthday though? Some would say, a more momentous occasion. 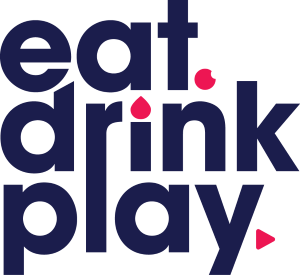 A decade as a restaurant indicates that its survived the relentless twists and turns of a constantly changing market. New diners have come, old ones have gone. It has successfully adapted itself to the discerning diner’s changing palate. For Efendy, Sydney’s favourite Turkish restaurant, their 10th birthday comes as a good reason to celebrate. In the courtyard is a scattering of crimson garden umbrellas with ample outdoor seating. If you didn’t know any better, you’d think you’re about to enter your great aunt’s palatial mansion. This two storey federation, coated in neutral beige comes fit out with stained windows and seasoned trees woven into the framework. This federation theme continues as you venture indoors. Turkish textiles and the prized relics from Anatolian villages work in harmony with dark stained tables, red bricked walls and warm lighting. Wander upstairs though and there is a disconnect between the two floors. Downstairs offers a more casual mezebar. Groups of hungry guests laugh loudly, clinking glasses of Turkish wine together and tearing off hunks of pita before mopping up a smorgasbord of dips. It’s a passionate eating affair. Upstairs comes across more formalised. Tables are covered in luxe white cloth, Turkish ceramic plates cling to the walls. Conversations are quieter. 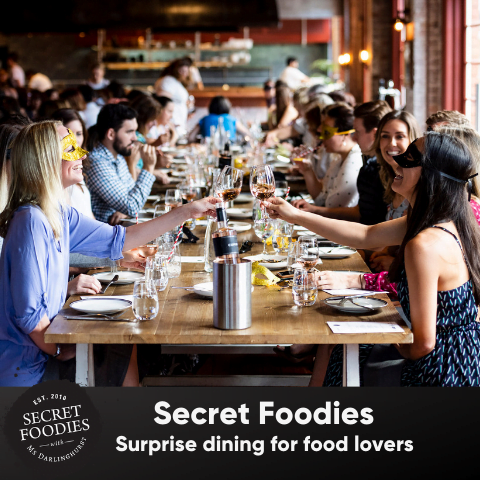 It’s a tighter space, evoking a more intimate dining experience. My date and I are ushered to one of their large wooden tables downstairs. We quickly dive into the beverage list. For cocktail lovers, the Turkish Delight Martini is a must try, combining gin, Cointreau, lemon zest and rose water ($15). The zest offers a welcomed tang, the rose water only a subtle flavour addition. Fret not, you won’t feel like you’re drinking a bar of your nan’s rose scented soaps. Like a reward for finishing your drink, a little Turkish Delight lingers in the bottom of your glass. Have no shame in gobbling it up, the waitress discloses that it’s a common practice. Or at least that’s what she tells me. For those looking for a less fruity beverage, get into the Anatolian spirit with a Turkish beer or a glass of boozy raki. Scanning the wine list, you’ll notice that it’s profuse with Turkish vinos. Istanbul-born chef and owner Somer Sivrioglu is the only Australian importer and creates a list of his home country’s best to match his menu. Curated with the help of Enis Guner, owner of Sevilen winery on the Aegean coast in western Turkey, Efendy’s wine list is 70 per cent Turkish showcasing largest selection of local grapes like Narince, Kalecik Karasi and Okuzgozu. With eyes bigger than our stomaches, we commit to the Charcoal Feast with matching wines ($98 pp). First on the menu is their signature Meze tray. On an intricately engraved silver platter lies an assemblage of dips. 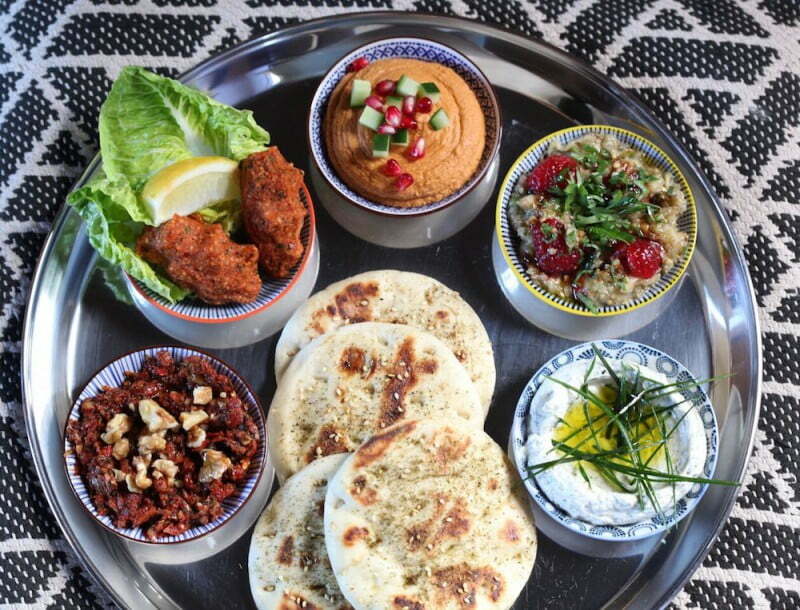 You’ve got everything from a cooling tomato, capsicum and walnut ezme, to a creamy pomegranate humus. there’s a Haydari, otherwise known as a nettle and spring garlic yoghurt, as well as smokey eggplant, tahini and pistachio – my personal favourite. If you look around the room, you’ll notice there’s a unspoken ritual to the eating process. First tear off a hunk of pita. Glide it through one of your dips. Have a sip of wine. Tear off another piece. Drag it through the loose yoghurt Haydari or perhaps the thick, velvety humus. Have another sip of wine. Although quite different, what you’ll find is that each of the dips work well together. Also resting on the tray are two cig koftes. My impression of kofte is a warm succulent meat ball equivalent. To our surprise, these ones are served cold and meat free. Wrap your baby cos leaf around the little morsel of spicy bulgur, mint and Turkish chilli and relish the flavour complexity. Complimenting the meze tray is the 13 Narince, Isabey, Tokat. With each sip, you’ll find it strongly reminiscent of a good quality sauvignon blanc. It’s a light, easy drinking wine with subtle floral notes. It’s the perfect companion to your dips. Cutlery remaining untouched, we’re soon met by our next course, spiced lamb findik lahmacun, made with sumac and red onion. 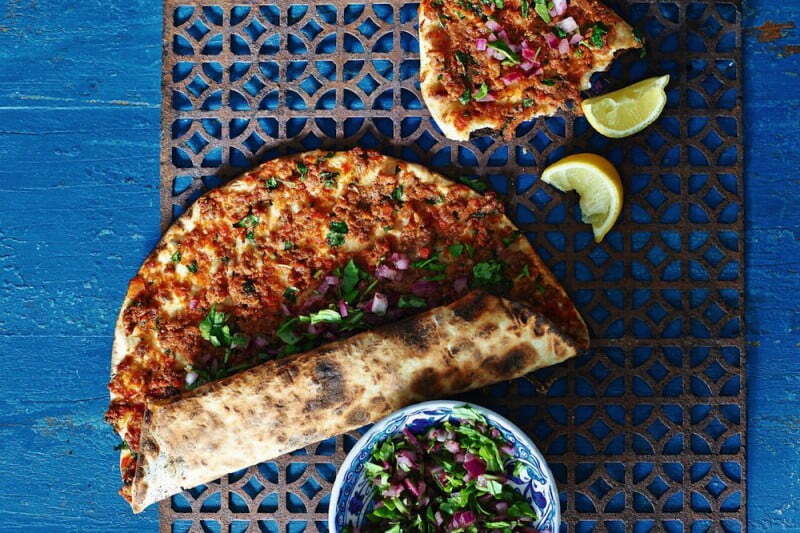 It resembles a small Turkish pizza, topped with lamb mince, spices and finely sliced red onion. We are told to roll them up before going in for a big bite. The flavours are punchy, the onion hitting you square in the face. The meat is also cooked in a variety of spices, adding a little extra oomph. In the knowledge that you’ll have onion breath for an eternity, you’ll keep going back for more. Complimenting this is 13 Okuzgozu, Magnesia, Guney Denizli, Turkey. It’s a velvety red which is hard not to drink in big gulps. The star of the show in tonight’s marathon eating venture is the charcoal board. It comes as the latest addition to the Efendy menu. Talking to Sivrioglu, he explains that a recent trip to his home country inspired him to reignite charcoal grilling which is found in street stalls and restaurants across Turkey. Although being the oldest cooking method of civilisation, Sivrioglu explains that it is also one of the hardest. The secret to cooking with coals and capturing the smokey flavours lies in having no flame, just glowing embers. Even if you didn’t know how it was cooked, you’d respond to the smokey richness quickly. 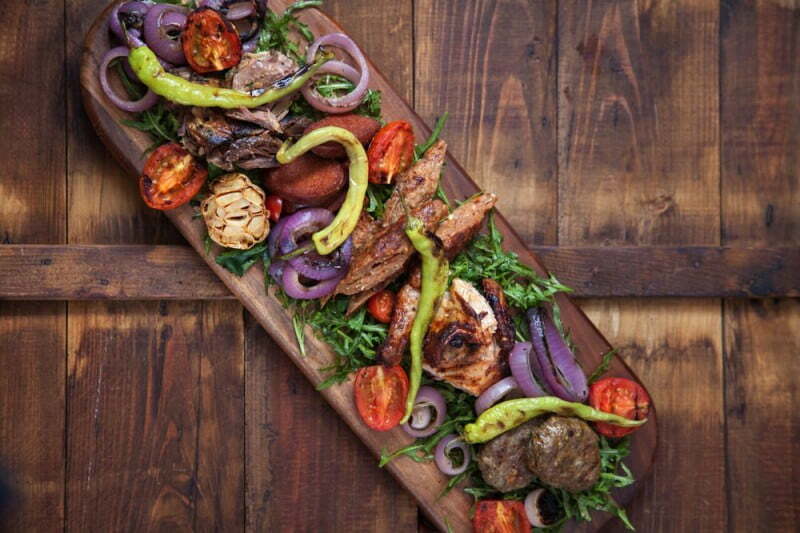 On a three foot long wooden board lies an entire spectrum of aromatic meats. You’ve got everything from grilled spicy sujuk, Adana style lamb kebap, chicken thigh fillet, beef and pistachio kofte, lamb shoulder and lamb belly skewers. The chicken succulent, contrasts salami. The lamb, beautifully tender, works nicely with the meat kofte. Nestled in between these various meats are little mounds of finely sliced Spanish onion, fresh parsley, grilled tomatoes, and roasted whole green chillies. For a little break, take in a mouthful of grilled tomato. It refreshes the palate whilst the roasted chillies provide some welcomed heat. A robust, heavy main requires nothing less than a punchy red wine. Thankfully the 13 Syrah, Centum, Guney fits the bill perfectly. The waiter explains that this is the most popular wine on the menu. It makes sense, as a delectably smooth drop with a subtly smokey nose. With each sip you’ll wonder why you haven’t been drinking Turkish wine for years. Our second stomaches come into play just in time for dessert. Trust us when we say, you’ll want to keep room for this one. On a glossy ceramic plate is Efendy’s signature Turkish mess, a Middle-eastern take on the British classic. 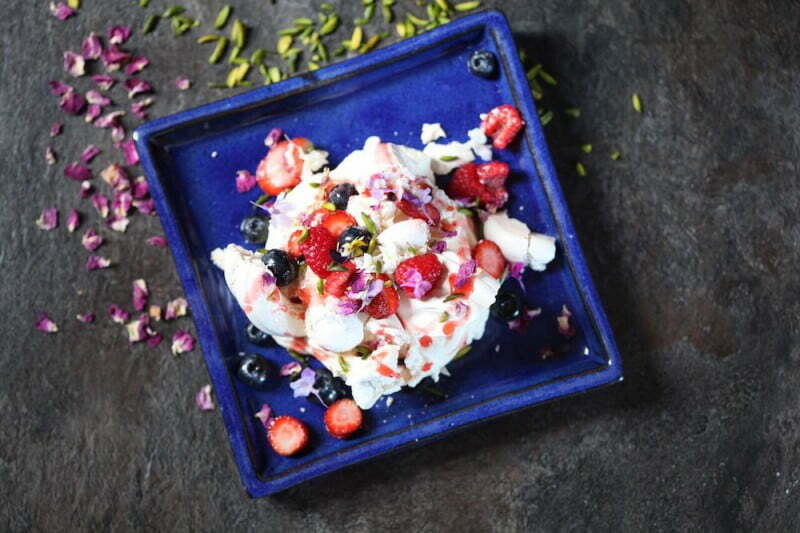 We gather the merengue, lashings of Turkish delight cream, fresh berries, rose and crushed pistachio onto our spoons, taking large mouthfuls. They say the last meal leaves the strongest impression. For us, we leave on a particularly sweet note, accentuated by the last matched wine of the night, the 13 Muscat, Sevilen Late Harvest. 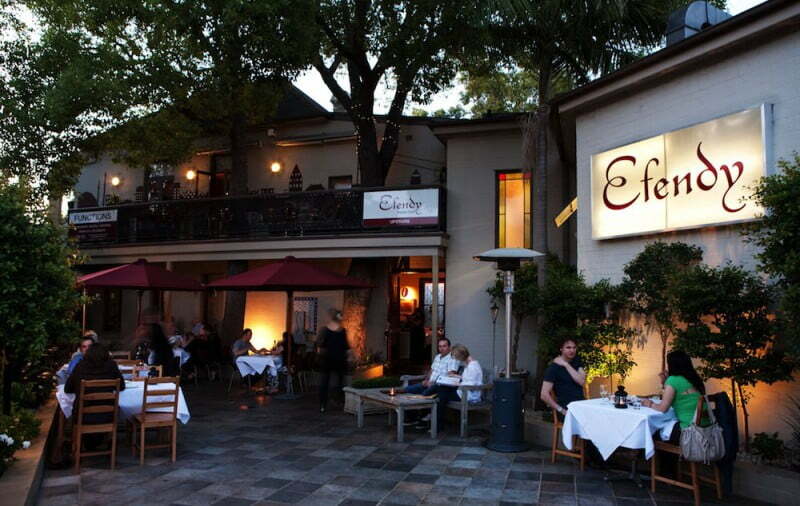 Efendy is a Balmain institution. Although this year marks their 10th birthday, in many ways they haven’t aged a bit. The life and passion in this restaurant is palpable, Sivrioglu’s loving familial ideals translating directly onto the plate. Will we be back? Absolutely. Next time, we’ll be bringing a big crowd so that none of that delicious charcoal meat is left on the plate.